Gary passed away February 11, 2008, after a battle with cancer. founding member of the club, and served on the Board of Directors. Each issue of SVO Enthusiast will highlight a member of the SVOCA, a little about the member and a little about their cars. This time lets meet Gary Alsobrooks member #0005, editor of the SVOCA-ENTHUSIAST and is one of the Founding Five Directors. Gary just topped the hill of the big four-ooh, lives in Hendersonville Tennessee and gets bossed around by wife Lynette and 5 year old son Ryan. 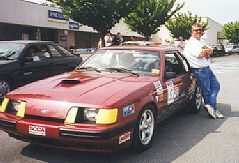 Gary's background in organizing car clubs goes back to 1980 when the Music City Mustang Club was formed as a region of the Mustang Club of America and has served in PFCA, SAAC, and SVOOA positions through the years. Gary brings a lot to the table at SVOCA, insight on running an organization such as this and creativity from stints at advertising agency positions. Earlier this year Gary co-organized the largest gatherings of SVO Mustangs ever at the SVO REUNION 98 held in Nashville Tennessee which led to the organization of the SVOCA. Purchased in 1995 to serve duty as a daily driver his '84 canyon red SVO now mainly sees autocross competition. The '84 has received a full package of suspension additions from Kenny Brown Performance and is going through a continuous transformation into a better autocross prepared car. ALSOBROOKS, Gary Dewayne "Kodak"Age 49 of Hendersonville, TN, passed away on February 11, 2008. Gary was an active member of Long Hollow Baptist Church. A car enthusiast, he had an immense love and appreciation for the Saleen Mustang. He loved traveling and spending time with his family. Gary is survived by his loving wife, Lynette Alsobrooks; his son, Ryan Alsobrooks; his parents, Lloyd and Joyce Alsobrooks; his brother, Scott Alsobrooks; his sister, Tracy (Shannon) DeSirey; and several nieces and nephews. Funeral services will be conducted at 2 p.m. on Thursday, February 14, 2008 at the Hendersonville Funeral Home Chapel. Interment will follow in the Hendersonville Memory Gardens. Memorial contributions may be made to Defining Moment, c/o Carl Phillips, 123 Choctaw Dr., Hendersonville, TN 37075. Visitation will be from 12 p.m. until 8 p.m. on Wednesday, February 13, 2008 and from 11 a.m. until the time of service Thursday, at the HENDERSONVILLE FUNERAL HOME, (615) 824-3855.